This guide is a work in progress. After reading some other people's questions about processors for the Microserver Gen8, including "What's the best choice for ESXi or HyperV use?" I wanted to create some sort of basic guide. For those of you who are geeks, you'll love this. If you're ADD or in the TLDR crowd, skip this thread. Neither are incredibly special, but for a home server running Windows Home Server, Windows Small Business Server, Server Essentials, or FreeNAS, they should do quite well. Performance diferences should be minor between the two. But, what if you want to run virtual machines via a hypervisor like VMWare ESXi or Microsoft Hyper-V Server? Neither of these two CPUs are exactly ideal, as they are missing some of the features of enhanced processors like VT-d instructions, the cache is small, and you have two CPU cores with no hyperthreading support. At this point, an upgrade sounds like a good idea --but what do you choose? The answer to the question all depends on how many VMs you want to run simultaneously on your hypervisor and what their purposes will be. Tasks like SQL Server, Microsoft Exchange (at least, above a certain number of users), or an applications server require more horsepower than say, a basic domain controller (which even with DHCP, DNS, and other mainstream services, doesn't take a lot of load). One of the requirements *is* purchasing a CPU with ECC support; this negates many, if not all standard Core i3/i5/i7 processors. Note also, the Microserver Gen8 has a 150w power supply and a 35w TDP fanless heatsink design, something to keep in mind when upgrading --trying to slap in a 95w CPU probably isn't a wise decision. The L variants of the Xeon family are low voltage. While the 1220L's are not as powerful, they are very low power (20w TDP for the SB, 17w TDP for the IB). This is great if you're only running two VMs and if you want to pack the server to the gills with other items (e.g., more than just the four standard drive bays). The 1260L and 1265L pack more power, but have a 45w TDP, ten watts above the rating of the heatsink in the unit. Still very usable as others testing have found. The Xeon E3-1230 v2 (4 cores, 8 threads, Ivy Bridge) is a fifth choice. It is less expensive, and people have done this upgrade with success. However, it has a 69w TDP, and I tend to be of the conservative sort --I want as much power envelope left as possible for other devices (RAID controller, extra drives, optical drive), and I also want a cushion that doesn't exceed the heat removal capabilities of the box. If you aren't planning on adding much to your server though, it may be a good choice. Improved Intel QuickSync performance. NOTE: Not all of the processors listed have QuickSync (only the 1260L and 1265L v2 do) as not all of these have onboard graphics. Note also that due to the architecture of the Microserver Gen8 (which uses Matrox video rather than Intel Graphics as its primary) that I'm not aware that anyone has tested a QuickSync-equipped processor to confirm that these features operate correctly when such a CPU is in the system. However, should they work, the 1260L and 1265L v2 have the potential to provide a considerable boost to video encoding/transcoding performance if you use an application that supports it; the 1265L v2 will have probably a 20-40% performance increase over the 1260L in this area. Wikipedia also has excellent links if you search for "Sandy Bridge", "Ivy Bridge", or "Xeon" to explain history and architectural changes. Note: Something I did not realize until working more deeply today when replacing my Gen8 Microserver's processor. If you *do* wish to use Bitlocker or some other types of hardware encryption, one of the general requirements is having a system with a TPM (Trusted Platform Module). Plenty of modern enthusiast mainboards have this; the Microserver Gen8 does not. It is a purchasable option, with a general price of around $45-50. HP's part number is 488069-b21, which is meant for broad compatibility across the Gen8 line of servers. The part is a small daughtercard that connects to a TPM connector on the mainboard. As part of the procedure, a plastic rivet is also used in the installation. This rivet holds the TPM in place, and is designed to deform or break if the TPM is removed, to make you aware that security has been breached. Once the TPM is attached, it is paired to the mainboard for life, and should not be removed. Should HP need to replace your mainboard under warranty, you should notify them that you have a TPM so they may provide you with a new one for the new mainboard; the original TPM should remain paired with the original board, per HP's own instructions. The AES New Instructions are still useful in some other applications, but if you are looking to do full disk encryption, you will wish to purchase the TPM module as well. 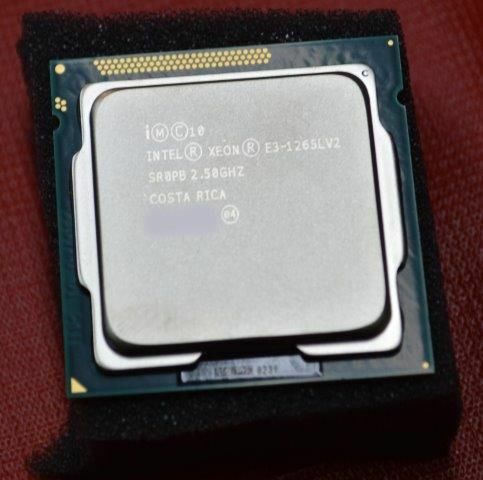 These processors are among the rare subset of Intel desktop CPUs that support ECC memory; you could think of them as very stripped-down versions of the Xeon E3-1220L v2. Both of these processors lack Intel VT-d, so they're not super choices for VM hypervisor work; unlike the Xeon, they also lack Turbo Boost dynamic clock scaling for higher single-threaded performance. They do bring Hyperthreading and QuickSync to the table. If you're buying a brand new CPU, they wouldn't be on my list as you're already partway to the cost of a new or used Xeon E3; however, if you're pulling one from another system or come across one cheap, they will improve performance over the original processors. The above named processor is discontinued. I've had my 1265L v2 for about a month, it's been a great upgrade. I do think it is probably the best CPU upgrade for the MS Gen8, followed closely by the 1260L, and then (if low power is a concern) the 1220L v2.